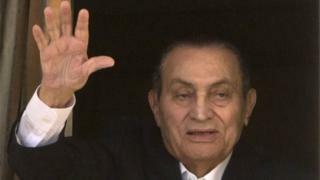 Former Egyptian President Hosni Mubarak has been freed from detention, six years after being overthrown. Mr Mubarak left a military hospital in southern Cairo and went to his home in the northern suburb of Heliopolis, his lawyer said. He was ordered freed earlier this month after Egypt's top appeals court cleared him over the deaths of protesters in the 2011 uprising. Mr Mubarak, 88, became president in 1981 after Anwar Sadat's assassination. Mr Mubarak was sentenced to life in prison after being convicted in 2012 of complicity in the killing of protesters who died at the hands of security forces in February, 2011. Another trial was held and a judge decreed in May 2015 that Mr Mubarak could be released from detention. However, the government of President Abdul Fattah al-Sisi was reportedly reluctant to free him because of the public backlash that might accompany such a move. Mr Sisi served as Mr Mubarak's military intelligence chief and led the military's overthrow of his democratically elected successor, Mohammed Morsi, in 2013. In all, more than 800 people are believed to have been killed as security forces clashed with protesters in Cairo, Alexandria, Suez and other cities around Egypt during the 18-day uprising that forced Mr Mubarak to resign.